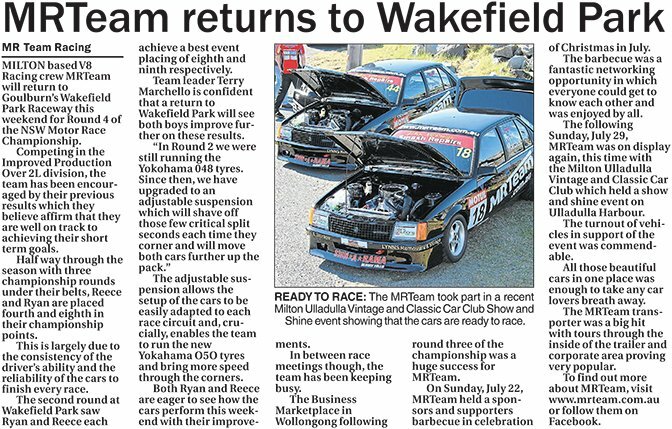 MILTON based V8 Racing crew MRTeam will return to Goulburn’s Wakefield Park Raceway this weekend for Round 4 of the NSW Motor Race Championship. Competing in the Improved Production Over 2L division, the team has been encouraged by their previous results which they believe affirm that they are well on track to achieving their short term goals. Half way through the season with three championship rounds under their belts, Reece and Ryan are placed fourth and eighth in their championship points. This is largely due to the consistency of the driver’s ability and the reliability of the cars to finish every race. The second round at Wakefield Park saw Ryan and Reece each achieve a best event placing of eighth and ninth respectively. Team leader Terry Marchello is confident that a return to Wakefield Park will see both boys improve further on these results. The adjustable suspension allows the setup of the cars to be easily adapted to each race circuit and, crucially, enables the team to run the new Yokahama O5O tyres and bring more speed through the corners. Both Ryan and Reece are eager to see how the cars perform this weekend with their improvements. In between race meetings though, the team has been keeping busy. The Business Marketplace in Wollongong following round three of the championship was a huge success for MRTeam. On Sunday, July 22, MRTeam held a sponsors and supporters barbecue in celebration of Christmas in July. The barbecue was a fantastic networking opportunity in which everyone could get to know each other and was enjoyed by all. The following Sunday, July 29, MRTeam was on display again, this time with the Milton Ulladulla Vintage and Classic Car Club which held a show and shine event on Ulladulla Harbour. The turnout of vehicles in support of the event was commendable. All those beautiful cars in one place was enough to take any car lovers breath away. The MRTeam transporter was a big hit with tours through the inside of the trailer and corporate area proving very popular.